I own a retail store. In between customers I usually have some downtime (Sometimes a lot of downtime - that's not good!). I'll usually use some of that downtime to skim eBay, Craigslist, AutoTrader.com, whatever, to find interesting cars. After finding one, I use some of the rest of the day's downtime to write about it. Once that is done I save it. When I wake up the next morning I check that the car is still relevant (i.e., pictures, info, etc., are still available to be linked to) and post it. Pretty easy, right? Every now and then something happens that makes me want to do a post right away and not wait for the morning. This is one of those cases. Just A Car Geek reader, Steve, just sent me an e-mail link to the car shown above. The car pictured above is a 1982 Triumph TR8. That's right, a 1982. I was under the impression that there were no TR8s sold after 1981. But there were. 70 of them, and they all went to Canada. Steve also sent me a link to some info about the 1982 Canadian spec TR8. While these were built in late 1981, there are differences between the 1981 TR8 and 1982 TR8. These were not leftover 1981s titled as 1982s. The reason they all went to Canada had something to do with the more lenient emissions requirements in Canada at the time. 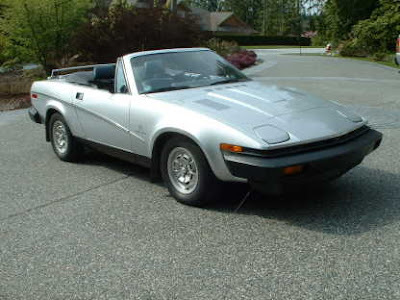 You can click here to see the site Steve forwarded to me with all the info on the 1982 TR8. The car above is for sale in Canada. The asking price is $12,500.00 Canadian, which works out to around $10,600.00 US. In my mind that's a very reasonable price for one of the last 70 TR8s made. Click here to see the listing for this 1982 TR8. This is one of the many reasons I enjoy writing this blog. Not only do I have fun, but sometimes I learn something new and there's nothing better than that! A big thanks goes out to Steve for sending this to me.